Ma Belle Mere and her sister Danielle made this salad for my family on a hot summer day in the Loire Valley where we were vacationing. The crunch of cucumber, soft and fruity tomatoes, the sharp tang of capers and lemon juice and fragrant olive oil and mint were refreshing and evocative of Algeria and Italy, where Marie-Paule and Danielle originate. 1 tablespoon minced fresh mint leaves. Toss everything else together in the bowl with the couscous. Adjust the seasonings as you like, more or less salt, mint, juice or oil. Eat immediately as the cous cous will continue to absorb the oil and juice and will seem dry. This salad can easily include or exclude items. Sometimes I put some onions or toasted pine nuts or raisin. Sometimes I omit the capers if I have a guest that doesn’t like them. If you don’t like Mint, use Basil, Marjoram, Parsley or Cilantro instead. 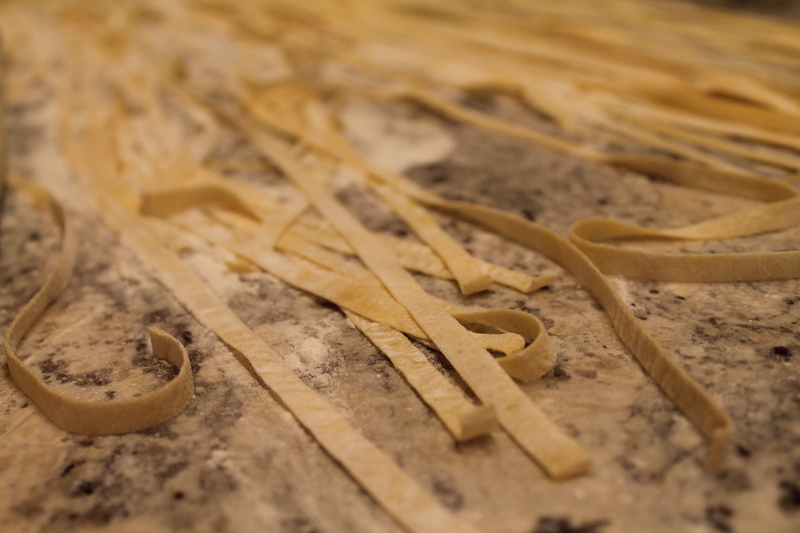 The difficult and time-consuming process of rolling out fresh pasta by hand is a long lost art. Back in Italy, my great grandmother’s pasta making skills were renowned. When she arrived in America she stuck to her roots and rolled out her own fresh pasta by hand until the day she passed. As an ode to her memory, I decided to try my own hand at making fresh pasta. Italian blood runs through my veins and making fresh pasta really brought me closer to my heritage and the memory of my great grandmother. Thankfully pasta machines have been invented which yield pasta just as good as hand rolled. With the pasta machine, it is simple to make your own pasta at home, which is exponentially better than the pasta you buy in a box at the grocery store. The difference between dried pasta and fresh is that dried is made of semolina and water while fresh is made of flour and egg. 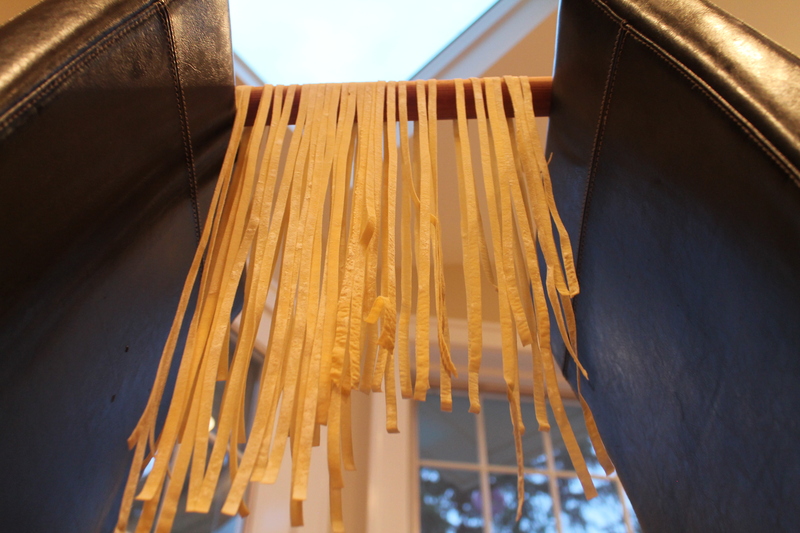 Fresh pasta is more tender and flavorful than its dried cousin. To go with my homemade pasta I really wanted to make a sauce. I figured that it would be a shame to dump store bought tomato sauce on my fresh pasta. In my opinion ragus, a tomato based sauce with meat, are the best type of pasta sauces. 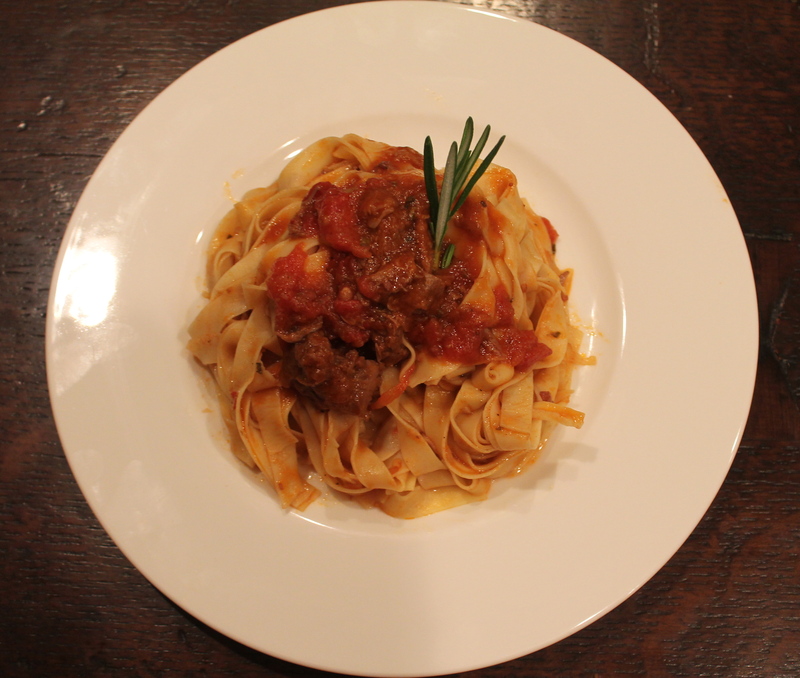 Bugialli, who is the king of Italian cookbooks, inspired the ragu I made. I used rosemary, onion and pancetta to build a foundation of flavor for my sauce then added in lamb, tomato and chicken broth. I also added a little red chili flakes to add a little punch. The lamb slowly cooks in the sauce creating a stew, slowly getting tender and releasing its flavor into the sauce. The end product is so tasty you could eat it alone as a soup. While there is art to pasta making, there is also an art to cooking pasta. Pasta is one of the most commonly served dishes in the world and is usually cooked incorrectly. The proper way to cook pasta is to cook it in very salty boiling water until it is 80% done, then drain it, and finish cooking it in sauce. By cooking the pasta in the sauce, it allows for some of the sauce to absorb into the noodles and cling to it. Anytime you have a bowl of pasta with a pool of sauce on the bottom, it was cooked incorrectly. While making your own pasta and sauce at home is more time consuming then opening a box of dried pasta and a jar of store bought tomato sauce, the reward is well worth the effort and the process is fun. 1 ½ pounds boneless lamb shoulder ProTip: Have your butcher remove any silver skin and excess fat and to cut the shoulder into 1 inch cubes. 14-ounce can tomatoes crushed ProTip: I like to use whole San Marzano canned tomatoes and then crush them by hand then drain off a majority of the canning liquid. 1. In a medium-large pot (preferably an enamel Dutch oven) heat olive oil over medium-low heat. When olive oil is hot put in chopped onion, pancetta, and rosemary. Sauté until pancetta begins to crisp and onion starts to caramelize. 2. Add lamb and brown on all sides. 3. Pour in the wine and cook for about 5 minutes. Meanwhile, dissolve tomato paste in 1 cup of chicken broth. 4. Pour in chicken broth tomato paste mixture reserving the other cup of chicken broth for later. 5. Add chili flakes and then cover. Cook on a simmer, stirring occasionally, for an hour. 6. After an hour, add the remaining cup of chicken broth and crushed, drained tomatoes. Continue to simmer covered for another hour. 7. On a large clean board place the flour in a mound and then make a large well in the center. 8. Put the egg, olive oil and salt in the well. 9. With a fork, mix the wet ingredients in the center of the well thoroughly. Then, begin to incorporate the flour from the inner rim of the well. Slowly pull in flour into the wet ingredients and continue mixing until about 2/3 of the flour has been absorbed. 10. Cover your hands in flour and start kneading the pasta dough by hand. Incorporate almost all of the reaming flour. 11. Cut the dough into 3 pieces. Run each piece of dough through a pasta machine on a wide setting then sprinkle with flour and fold into thirds then run it through again. Repeat this about 10 times with each piece of dough. ProTip: This method of kneading the dough creates gluten and makes it smooth and elastic. 12. Now you are ready to begin rolling out the pasta. Put the dough through a pasta machine on the widest setting. Then sprinkle with a little flour and move the machine to the next setting and run the pasta through again. 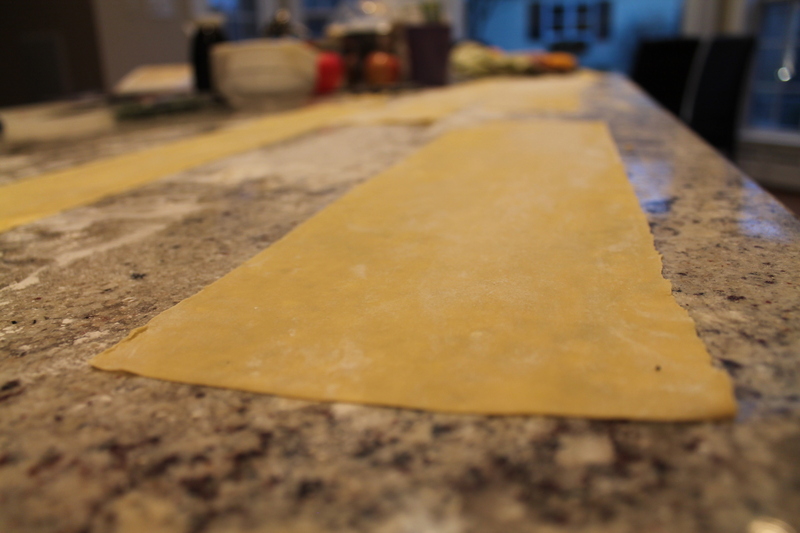 Keep reducing the thickness of the pasta, one setting at a time until your pasta is very thin. ProTip: When the pasta begins to be too long to handle cut it in half. 13. When all of the dough has been rolled out to the desired thickness you can attach the cutting attachment with thin teeth to your pasta machine and cut each sheet of pasta into fettuccine. 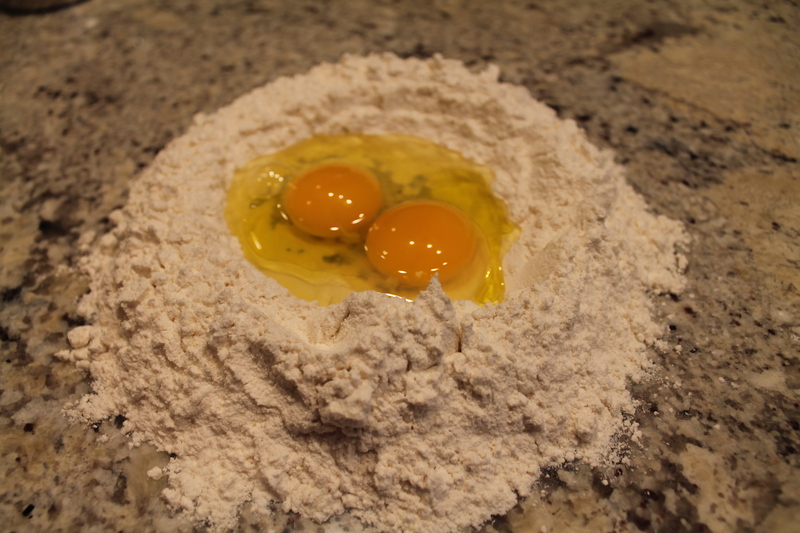 Sprinkle the fettuccine with flour and let it rest on the board until you are ready to use it. 14. When sauce is almost done season with salt and pepper to taste and pull apart the lamb shoulder into shreds with 2 forks. Then boil a very large pot of water. ProTip: Salt the water heavily; it should taste like the ocean. 15. When the water is at a rolling boil drop in the pasta and cook until it is very al dente, about 90 seconds. Then drain the pasta and return to the empty pot. 16. Pour in sauce to the pot with the pasta in it and finish cooking the pasta in the sauce on medium heat, about a minute or two. Serve and enjoy.